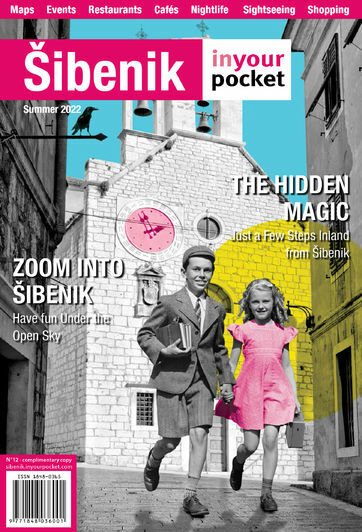 With its pale stone dome rising above the city like a gargantuan crocus bulb, Šibenik’s magnificent Cathedral exerts a dominating presence over the huddled buildings of the Old Town. 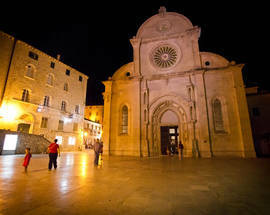 In a sense the church here is as old as Šibenik itself, although it is the century-long campaign of rebuilding initiated in 1431 that produced the imposing edifice that can be seen today. 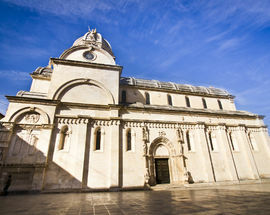 Frequently halted by lack of funds, construction took place in installments, and the new-look cathedral wasn’t officially consecrated until 1555. 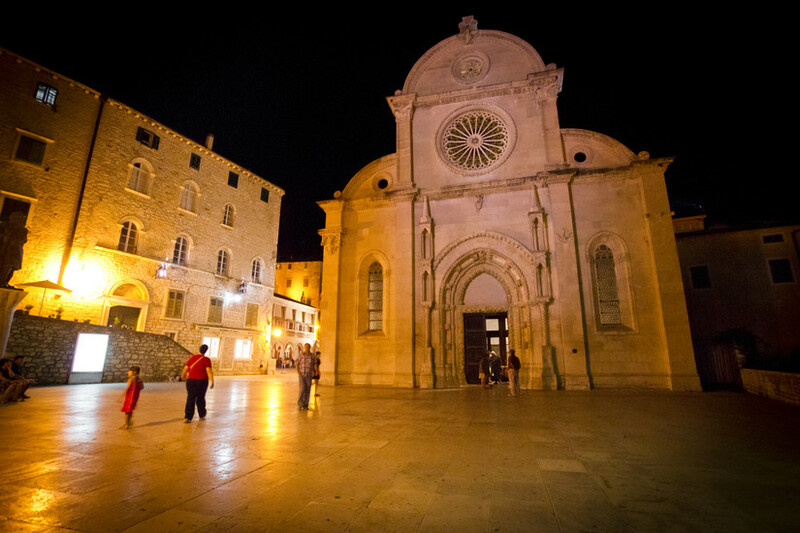 However it brought together many of the Adriatic’s finest craftsmen, foremost among them being the visionary architect Juraj Dalmatinac, and his successor Nikola Firentinac. 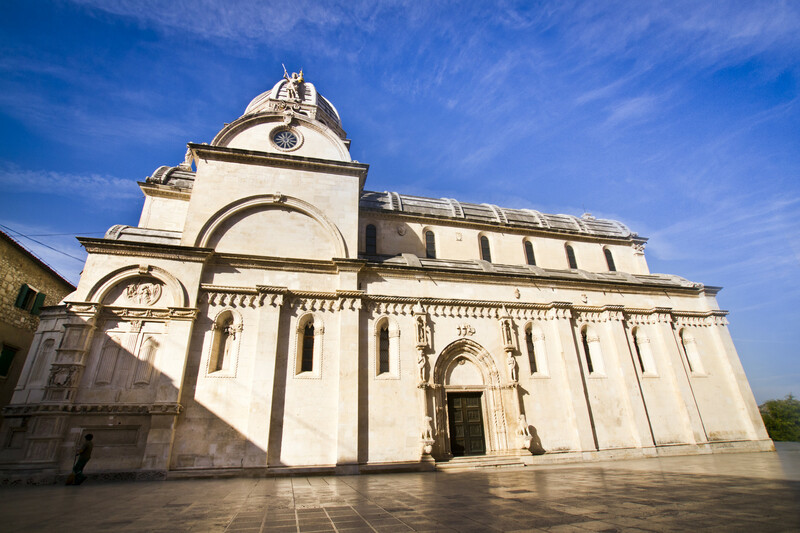 It was they who were responsible for the cathedral’s most innovative features, the barreled roof and massive cupola both built from interlocking stone slabs. Quite apart from its status as a marvel of construction, the Cathedral is also a hugely entertaining as a gallery of late-Medieval and early-Renaissance sculpture. The north portal is framed by endearingly primitive statues of Adam and Eve (both portrayed covering their private parts in embarrassment) standing on pillars which rest on the backs of lions. They are thought to be the work of Bonino of Milan, a craftsman from Lombardy who was brought in to work on the cathedral at an early stage but who died before the reconstruction really got going. 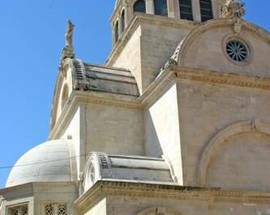 Much more refined in style are the sculptures and reliefs around the outside of the apse, where Juraj Dalmatinac provided a frieze of 71 stone heads – which appear to pop out of the wall just above human height. 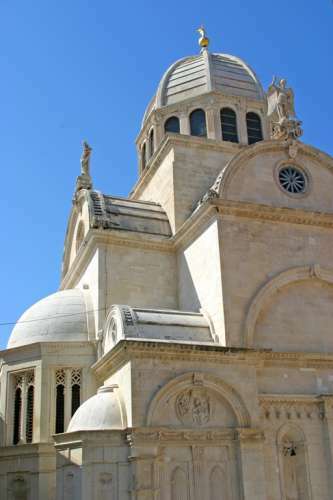 Thought to be modeled on Šibenik characters of Dalmatinac’s acquaintance, they are uniquely lifelike examples of Renaissance sculpture and have served as something of a trademark for the city of Šibenik ever since. Above the frieze, a pair of stone cherubs unfurl a scroll of parchment bearing the name of the artist, Juraj Dalmatinac. You’ll have to crane your neck upwards to catch sight of the statues grouped around the central cupola, all the work of Nikola Firentinac. A winged St Michael is portrayed spearing a dragon facing the main square, while St Mark faces the sea, and St James faces east. Standing at roof level at the western end of the cathedral is an Annunciation scene, also by Firentinac, featuring Archangel Gabriel and the Virgin. Inside, look out for a sarcophagus of Bishop Juraj Šižgorić with an effigy of the reclining bishop carved by Juraj Dalmatinac. The Altar of the Holy Cross bears a late Gothic crucifixion carved by Juraj Petrović, fifteenth-century Canon of Split Cathedral. Dalmatinac’s greatest masterpiece is the baptistery (krstionica) in the cathedral’s corner, which features a beautifully carved ceiling, and plump cherubs cavorting around the base of the baptismal font. Mass: June - August 09:00 and 20:00, Sun 09:30, 11:00 and 20:00. September, October, April, May 09:00 and 19:00, Sun 09:30, 11:00 and 19:00. November - March 09:00 and 18:00, Sun 09:30, 11:00, 18:00.